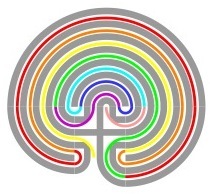 I can use the labyrinth in various ways as part of an individual coaching process. Usually as an element in a series of coaching sessions, the client and me choose a sandy location, e.g. a beach to go to. There I draw a labyrinth with my rake, following the clients preferences with regard to location, orientation, path or walls, and size. The client enters the labyrinth and does as he/she pleases; it is their own space to experience, to meditate on a question, to leave old convictions behind, to be inspired and so on. A description of this unusual coaching session can be found in the coaching menu. Some pictures are in the photo gallery. While walking the labyrinth, it so happens that the questions or feelings that are described in the next paragraph, surface spontaneously. Because they are perceived while moving around in an ample space in nature, the experience is different and usually leads to new answers and conclusions. It is surprising, moving, inspiring, and for everyone different. In my Dutch book Charm yourself into excellence! I use the structure of the labyrinth to describe the various stages of the process to reach for personal excellence. These different stages correspond symbolically with the consecutive circuits of the labyrinth that one passes while walking it. As the labyrinth is considered to be a metaphor for life’s journey, walking the labyrinth takes you symbolically through this life’s journey of developing your personal excellent expression. I do as I do! 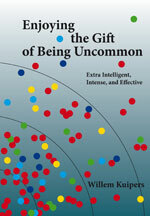 These stages are mentioned, but not elaborated on, in the Appendix of Enjoying the Gift of Being Uncommon. While I was writing Enjoying the Gift of Being Uncommon I had discovered that not only do the consecutive circuits of the labyrinth pattern correspond with the process of personal expression, but each circuit has also a kind of (Jungian) shadow aspect, where the process can stagnate. Intriguingly, clients who are actually stagnating in a specific stage of the process, experience a kind of resistance or hesitation in the corresponding circuit. Depending on the situation and the client, (re)walking that circuit with extra care helps to become more aware of the nature and causes of the stagnating factor, and possibly change the attitude towards it. I am grateful to have been witness to a couple of such occasions. One of the webpages of Applying Xi; The labyrinth of expression offers some additional information. The theoretical aspects of this labyrinth of flowing expression and of stagnation are elaborated in the appendix of Enjoying the Gift of Being Uncommon.